Snakes On A Plane exceeded my expectations. Going in, I figured I was going to be presented with a really bad movie, but I just had to see it because of the odd naming. I was pleasantly surprised to find the movie very entertaining, with plenty of both action and comedic value. Samuel L. Jackson was being his typical self in the movie, acting serious but coming off funny as hell. I wouldn’t recommend taking this movie seriously though, as there will be little or no value in it for you if you do. So if you’re looking for some kind of horror flick, or some kind of movie about terrorist attacks, this definitely is not for you. 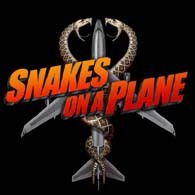 On the other hand, if you’re looking for an action packed film with a lot of comedic value, you cannot go wrong with Snakes On A Plane.